With only a few days until Halloween, Yetis and Friends have a few Halloweenie Friends in their store which will be their last release until Black Friday! These little wall monsters are adorable and spooky, promising to haunt up your home for Halloweens to come! Introducing their 18″ bone mage- known for being magic-obsessed gremlins. This guy looks like a little bit of trouble and a lot of fluff! (And I can’t turn down fluff and trouble) His bone-necklace and his hand-made crown give him such a fabulous Halloween flair that only a Bone Meal and Forest Slime eating gremlin could have. At $170, this elaborate & large Halloweenie friend is sure to be haunting a new home soon…. What Halloween is complete without a shaman shaking things up? This leaf-crown donning mini-shaman is no exception, promising to give your Halloween a fright its never seen once he’s up on your wall. The berries and leaves on his head and neck bring a festivity to him that gives him a welcoming air, tricking you into letting him put his spell on you! But don’t worry, this one is contained and happy. For $95 you can have your own mini-shaman blessing (or cursing) your walls for Halloween after Halloween. The Halloweenie-est of all Halloweenies is this little guy. At 10″, this black and orange trophy sits with his devious grin, ready to spook up the night! A classic Halloween-monster look mixed with the soft fuzzy fur brings this guy to the top of the “need” list for Halloween designer toys. These Halloweenie minis are only $70 so be sure to grab yours! Moths. Big Eyes, paper-thin wings, an obsession with light and with eating clothes. But something… something sinister seems to surround moths, and these Halloween moths confirm our suspicions. All should be fine in the home sporting one of these 12″ moths, as long as no one dares to come between them and their one true love – the light. Should you dare to invite one of these Halloween moths into your home, it will only cost $125! Coming out to steal the award for Cutest Halloweenie -ever- is this Mini Trick-or-Treatling. With his little candy corn-horns and appetite for “Ghoulios, Scuttles, and Boo-berries”, this 10″ trophy head warmed my vampire heart almost enough to bring me back from the dead! Omg his nose! And the teeth! And the orange! At only $70, this guy is sure to be sold out soon! 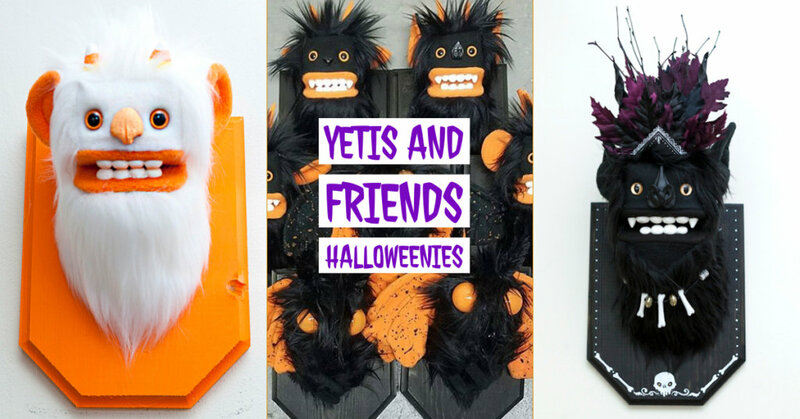 Now that you’ve seen just a few of the Halloweenie Friends, be sure to head to the Yetis and Friends site to check on their other toys available and follow their Instagram to be sure you can see all the new happenings and updates!